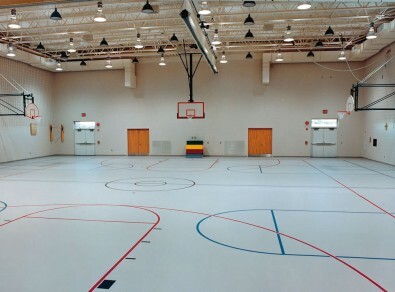 Boflex flooring is designed to be as well suited for recreational activities and athletic competitions as it is for withstanding the weight of a heavy grandstand. In fact, the foam understructure can only be compressed to a maximum of 50%, making overloading of the floor virtually impossible. It’s constructed of a real wood top layer, a balancing softwood middle layer cross-angled for dimensional stability, a bottom layer and a patented built-in foam bottom structure that delivers exceptional shock absorption and sound absorption. Featuring a tongue & groove design, adhesive is placed in the groove portion for a permanent installation. 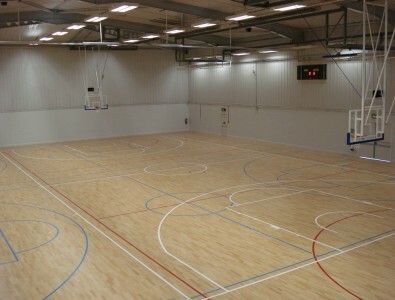 Boflex indoor wood flooring is engineered to accommodate the high demand for quality hardwood gym flooring for basketball courts, volleyball courts, racquetball and squash courts, and many other applications. Boflex’s 1-1/8” profile includes a 3/16” prefinished hardwood top layer, diagonal layer of wood for added stability, and a patented and fully integrated dual foam channel system recessed into the backside of a hardwood base which eliminates the chance of the foam being damaged or crushed.